The demo video below is just a temporary measure until I get some time to do an improved one. The holders have a number of features that increase their versatility and make them ideal to use on smaller less rigid lathes. The inverted blade design significantly reduces the chance of a jam-up and blade breakage. Because the holders can take five different widths of blade they can also be used for cutting circlip and "O" ring grooves, turning cooling fins on model engines and many other custom uses. Minimal side overhang and no front overhang help maximize rigidity. Cutting takes place on the underside so swarf will tend to fall out of the groove rather than pile up on top of the cutting edge. The lack of swarf on top of the blade means coolant is free to get right in to the cutting edge. The wedge style shank on some models eliminates the need for thin shims when setting the blade at centre height. The horizontal mounting of the blade further reduces the chance of the blade pulling itself into the cut and is especially advantageous when turning brass and bronze. Simple to resharpen as only the front face has to be ground. Wide choice of blade widths to suit a variety of workpiece diameters and situations, all the blades fit the one holder. Once set the blade will stay on centre height when extended or retracted. Fine adjustment system for tool height, no more thin shims needed to get the cutting edge exactly on centre. The versatility to be used in a front or rear tool post. Clamping along the full length of the holder aids rigidity and keeps the blade straight and square. A slight concave radius is ground along the top (bottom) of the cutting edge and this aids chip curl, assisting in swarf ejection from the cut. Blades can be left with sharp corners to ensure the pip is removed at the end of the cut, or if preferred a slight chamfer or radius can be added with an oilstone/hone to reduce striations in the surface finish and increase the strength of the blades corners. The blades can be resharpened multiple times and if used with care one blade will outlast many packets of indexable tips. For lathes with a screw on chuck the parting tool must be used in a rear tool post with the lathe running in the normal direction. For lathes that are able to run safely in reverse, ie a camlock, bolt on, or LO fitting, the parting tool can be mounted in either the front tool post and the lathe run in the reverse direction, or in a rear tool post and the lathe run in the normal direction. The FoR(SC) version is designed to be used the normal way up in a front tool post or can be inverted for use in a rear tool post. The holders take the 1/2" "T" type blades, also known as Empire blades (the original manufacturer)or Luers blades (the German inventor of this design) this design of blade has been used in the USA for decades on production turret lathes and screw machines. The 1/2" blades are available in five different widths from 1mm (.040") to 3.2mm (1/8") and they will all fit the same holder. Premium quality blades are available on the website and are sourced from a leading US manufacturer who supply tooling for the production screw machine, CNC, and turret lathe market. The blades are simple to sharpen as they only need the front clearance angle to be ground, this is easy to achieve on the side of the wheel of a bench grinder. The top of the cutting edge (the bottom in our case) never needs touching, the blades can also be reversed in the holder so they can be ground on both ends to save time between sharpening. The blade design incorporates a small hollow grind along the length of the cutting edge to help curl the chip and avoid chips jamming in the groove. 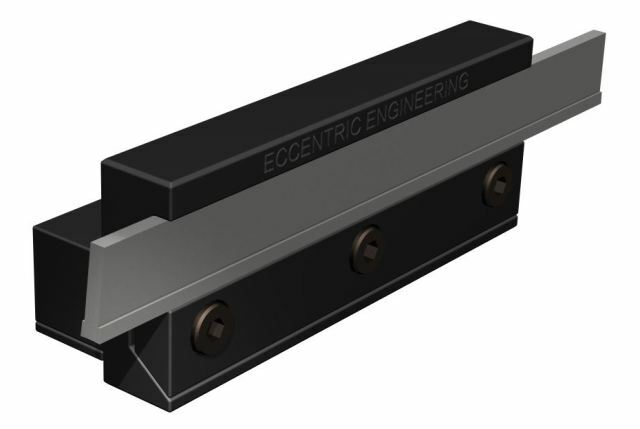 To aid setting the cutting edge exactly on centre height the holder has a 7° taper cut into the shank and a matching adjusting wedge that can be moved back or forth to give up to 1mm (.040") of vertical movement. This avoids having to use thin shims to pack up the holder to exactly the correct height if you don't have an adjustable tool post. Two small rare earth magnets hold the wedge securely in place when adjusting, and a line can be scribed across for quick repeat setting. The 8mm holder is adjustable from 7.5mm - 8.5mm. The 9.5mm holder is adjustable from 9mm - 10mm. The 12mm holder is adjustable from 11.5mm - 12.5mm. The 16mm holder uses a square 16mm shank and suits tool heights of 16mm (5/8"). FoR8(SC) = 11mm(7/16") shank and suitable for 8mm(5/16") tool height. FoR9.5(SC) = 12.7mm(1/2") shank and suitable for 9.5mm(3/8") tool height. If you peruse the internet long enough you will find a huge difference of opinion on the ideal method of parting or cutting off in the lathe. You will find polar opposite views on almost every facet of parting off. Power feed vs hand feed. Indexable carbide tipped tools vs HSS blades. Rear tool posts vs front tool posts. Upside down tools vs conventional tools. Positive rake angle vs zero rake angle. Fast speed vs slow speed. High feed rate vs low feed rate. Having the cutting edge on centre vs above centre vs below centre. About the only thing everyone agrees with is to always use coolant and have the blade as square to the job as possible. Geo H Thomas the highly regarded UK model engineer and author of several books on the subject spent a huge amount of time investigating the ideal way to part off in a smaller lathe and concluded a HSS blade held up side down in a rear tool post gave the best results. An upside down blade held in a front tool post with the lathe running in reverse will also have the same effect. Really it all comes down to what works best for each individual on their particular lathe and doing their particular tasks: even the same make of lathe will have different amounts of play in the slides and spindle which can affect things. The FoR Parting Tool Holder has been designed to minimize overhang to make the setup as rigid as possible, maximize versatility with the ability to be used on a front or rear tool post, able to use multiple widths of blade, ease of setup, ease of use, be simple to resharpen, and cost effective. The holder is case hardened to 40HRc for durability, made entirely in Australia and all parts and materials are sourced from Australian suppliers with the exception of the blades.